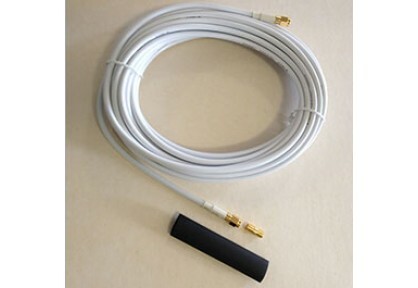 The cable supplied with the WatchMate Vision, XB-8000 or XB-6000 transponder external GPS antenna is 10m (33') long. You can easily extend that cable another 10m (33') with this kit. Adhesive lined heat shrink tubing to seal and waterproof the connection. Note: This cable does not fit the newer style WatchMate 850 GPS antennas (GPA861). If your WatchMate 850 has this external GPS antenna then this cable cannot be used. If your WatchMate 850 has the older style antenna (GPA851), then this cable may be used. Please contact us if you aren't sure which type you have.